The ruins of Menlo Castle sit on the banks on the River Corrib in Galway. The castle was built in this strategically important location 1569 by the Blake Family who arrived in Galway with Strongbow and are said to have been descended from one of the Knights of the round table. The Blakes soon became one of the powerful Tribes of Galway, a group of fourteen merchant families who came to dominate all aspects of life in the city of Galway between the 13th and late-19th centuries. On the 26th July 1910 a tragic fire broke out which totally gutted Menlo Castle. 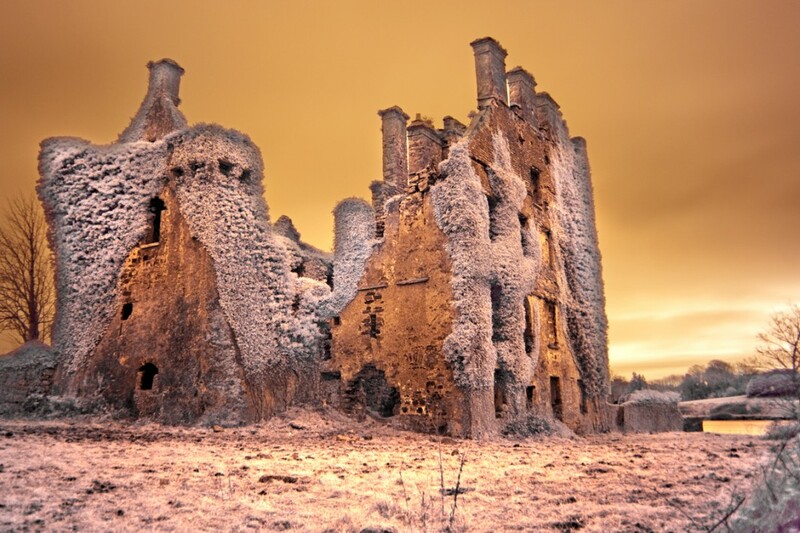 The fire claimed the lives of Miss Ellen Blake, daughter of Sir Valentine, the fourteenth baronet and Lady Blake and also Delia Earley, a servant working in the castle. Menlo castle is likely to remain a ruin for the foreseeable future as in 2010 a plan by City Hall officials to restore it were shot down by the City's Councillors. Instead the elected members voted to preserve the ruin rather than restore the castle.